Mello is executive director of the Los Alamos Study Group. 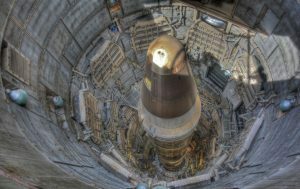 The group put out a statement on the U.S. government’s major nuclear policy statement, the Nuclear Posture Review. A new NPR was release on Fridayafternoon — which was last updated in 2010. Mello said today: “What is most ‘missing in action’ in this document is civilian leadership. Trump is not supplying that. In part the fault for this comes from Democrats — who, allied with the intelligence community and other military-industrial interests, insist that the U.S. must have an adversarial relationship with Russia. There is no organized senior-level opposition to the new Cold War, which is intensifying week by week. This document reflects, and is just one of many policies embodying, the new and very dangerous Cold War. “Unfortunately the ‘hard power’ approach that we see in this NPR eliminates better options as it proceeds and creates the enemies it needs to justify high military expenditures. Fear is used to create more fear — and more appropriations. In that sense, our nuclear missiles are aimed at Congress. They are also aimed at the American people, whose nuclear fears were consciously cultivated and used as a social control mechanism by government in the first Cold War.